By several metrics, including the state’s own registrars, Nevada has one of the highest divorce rates in the United States. There are multiple reasons for this, not least of all that it is very easy to get married in Nevada, but it is also very easy to get divorced. While picking up and moving to Nevada for the sole purpose of divorcing is discouraged, it may have advantages if you happen to live in the state already or spend a lot of time there. Nevada law is written in such a way that divorces can be quick, which in some cases, can be cause for relief and celebration. One of the major reasons that many people may gravitate toward Nevada divorces is that the residency requirements are significantly shorter than most other states’. While other states may require months or a year’s residency, Nevada requires only six weeks, though an affidavit attesting to the good-faith residency and intent to remain must be presented at the time prior to entry of the Decree. If neither you nor your spouse meet the residency requirement, Nevada courts will not have jurisdiction. 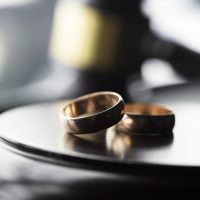 A possible reason for Nevada’s high divorce rate is that there are often more stressors present in Nevada, due to some of its unique legal “vices,” that can affect a marriage. Money woes are also a commonly cited cause for divorce. Gambling addiction is unfortunately common. Nevada has a somewhat peculiar culture when it comes to divorce and its surrounding issues, but some things never change. One of those is the necessity of having an experienced divorce lawyer on your side. The attorneys at the Kainen Law Group are happy to sit down with you and try to help you decide the best plan for you to move forward with your life. Call the office today to set up an initial consultation.